The Sydney competition under ‘Northern Union’ rules, as it was often referred to then, with its 13 players and the playing of the ball, commenced in 1908. Spectators were excited by the open flow of the game and players preferred it. By 1911, with a rapidly growing fan base, a most successful tour by the British Lions, and defections from the Wallabies, League had become ascendant in the city. However country towns didn’t just follow fashion and fall into line. Newcastle established a competition in 1910. The following year the new code took root in the Hunter coalfields, the Illawarra coal towns and one other mining town, West Wyalong. Tamworth and Orange followed a year or so later, but it was the dusty little town in the mallee, less than twenty years old, which blazed the trail in the Riverina and south-west region. By May 1911 Rugby League has supplanted Union in West Wyalong. For a detailed history see Peter Campbell’s book From the Goldfields to the Mallee Men: a history of West Wyalong Rugby League Football Club 1911-2010. Why was West Wyalong such an early adopter? That the association was called the Goldfields Rugby Football League hints at its working class origins. The gold fervor that had earlier established settlements at Young, Grenfell, Temora, and Barmedman were now just memories in those places. In the Wyalong area mining was waning but it was still the biggest employer in town. This was also a very different social and economic environment to Lambing Flat fifty years before. It was no longer about simply mates getting together and trying their luck. It was industrial and capitalised. The town-scape was dominated by poppet-heads over shafts, some more than a 1000 feet deep. It looked and felt like coal mining. Many men belonged to the Amalgamated Miners’ Association of Australasia. They were required to work a hard six days week, resting only on Sundays. But perhaps it was simply the enthusiasm and industriousness of the football club committee at West Wyalong for the new form of the game that made the difference. Being a new town there had been little time to develop a traditional allegiance to any code. There was also the social geography. Most men on the surrounding farms favoured Australian Rules. Thousands of Victorian farming families continued to stream north to take up closer settlement blocks for wheat and sheep farming. To the west and south of Junee, Temora, Barmedman and West Wyalong a subtle line could be determined where the ‘Australian game’ was the established game. Town dwellers tended to come from the east and be familiar with Rugby. In the autumn of 1911 at West Wyalong local teams were formed to play the visiting Sydney Combined Tramways. In the winter the great international player Arthur Hennessy was appointed as coach to demonstrate the finer points of the game. In the spring the Goldfields League railed down to play in Sydney. They played three matches – the last a curtain-raiser in front of 25,000. The monument in memory of the Barrier miners in Barnado Park, West Wyalong. Perhaps the dreadful mining disaster of Monday 13 January 1912 solidified the community around Rugby League. 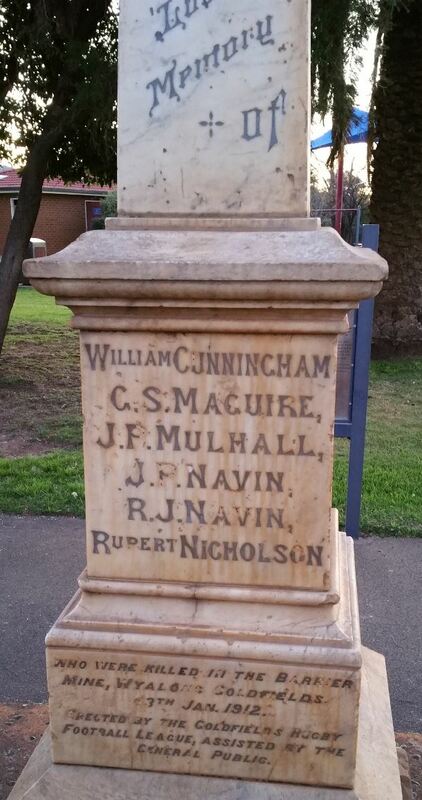 Six men were killed, including John Mulhall the captain of the Goldfields team (and champion euphonium player), brothers Robert (Bert) and John Navin – Rugby League referee and representative respectively and Rupert (Rue) Nicholson, also a Rugby League player and unionist. An eloquent poem was published in the Advocate. The club and the town provided support for the widows. A prominent memorial was erected in Barnado Park. In 1912 the NSW Rugby League provided funds to improve the local ground, which received visits from Tramways and South Sydney sides. The team travelled again, to play the South Coast this time. Wyalong formed more local teams and started to spread the word to places nearby. A union with Barmedman, Ariah Park and Temora was sought. In April they visited and played Ariah Park and played an exhibition match at Barmedman. In June Ariah Park and Barmedman players joined the Goldfields team that played a Combined Sydney team. In the 1913 season Rugby League teams were formed in Australian Rules territory at Ardlethan Town, Ardlethan Tin Mines and Beckom. They played in competition with Ariah Park. In June 1913 the Goldfields team visited Barmedman and played them again the following month ,while tiny Beckom sent a team to play at West Wyalong’s White Tank ground on 16 August. There were reports that Rugby League clubs were also formed in 1913 at Junee, Coolamon, Ganmain and Wagga. However no match reports have been located. The Rugby League club was formed in April 1914 in the Railway Hotel and the Rozelle Tramway Team visited. According to the authors of Temora Yesterday & Today 1880-1980 – ‘Due to the First World War the code had a relatively quiet introduction to Temora with games being played between social clubs and by servicemen who had learned the game in Sydney and overseas…. Around 1919 a local competition representing various sections of the town was played as ‘reds’, ‘blues’ etc…’ By 1920 inter-town Rugby League cups put up for play at West Wyalong (Chigwidden), Barmedman (Shields) and Temora (Meller) meant frequent inter-town trips between these wheat towns. Temora defended the Monty Meller Cup in 1920 against West Wyalong, Barmedman, Harden and the Cootamundra Bing Boys. The commencement of chaos in Europe lead to a cessation of adults playing games, or at least most newspaper reportage of it. So public football was largely the preserve of school-children for the next few years. Except it seems at Stockinbingal where in 1917 the Waratahs were formed to play Rugby League and looked about for some competitors. While the above towns were now wedded to League, in 1919 most towns resurrected their 15 man teams. Also the deadly ‘Spanish Flu’ epidemic killed thousands in the State that winter and hindered the development of football. It curtailed much inter-town travel and any visits by city teams, while reducing the amount of contact teams could make generally. Another problem for League was the growing resistance of local government to grounds being used for sport on the ‘Sabbath’. Cricket, tennis and football had been played in country towns and villages for decades without much fuss. What was now different was the more organised nature of sport, the paid admission factor that League required, the growing temperance movement and fear from churches that their rural pre-eminence was under threat. While Rugby League was not necessarily identified as a Sunday game it was for most town workers the only day they had off. The wowsers were mainly from the Protestant churches and seemed particularly influential in Temora, Cootamundra and Young. In Junee, in 1919, where the railways workers ran the show, they jumped right in and created a local Rugby League competition which included five teams: Illabo, Old Junee, Junee Reefs, Waratahs and Rovers. There was even a team formed in the Australian Rules stronghold of Coolamon. Prominent Junee priest Monsignor Buckley donated a cup to encourage the game and develop ‘healthy, clean spirit’. Perhaps it is indicative of the difference between Catholic and many Protestant churches of the time that Buckley was perfectly content for his cup to be played for on Sunday afternoons. 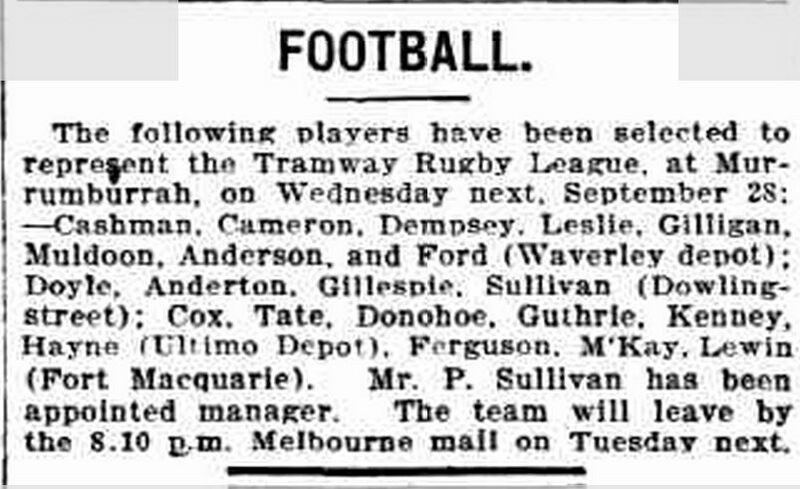 The Referee reported that Murrumburrah had taken up Rugby League in 1910 and with the Evening News recorded a combined Tramway Rugby League team journeying to play on Wednesday 28 September. They had previously played at Lithgow in that town’s first League match. No match reports have been located. It is clear that Harden-Murrumburrah played the Union game in 1911 and continued to do so until after The War. In 1917 a spectator was accidentally killed while watching a Sunday Rugby (union) game at Murrumburrah. Three Protestant clergymen sought curtailment of games on Sunday. When Father Hartigan mocked their position is a poem published in the local paper they sued him. In Harden, like Junee, railways workers dominated the workforce. In August 1918 Harden entertained Eveleigh Loco and defeated them playing League. They adopted League readily in 1919. On the Main Southern Line it was in the age of rail a handy place to meet up. The broader Southern Districts Football League was established there in April 1919 and comprised Harden (and Murrumburrah), Temora, Yass and Young. In March 1920 a revised organisation the Southern Divisional Rugby Football League, composed of Temora, Moss Vale, Goulburn and Harden was formed. Planning for a grudge match between Harden and Yass for a massive £200 stake was widely publicised in 1920 but eventually abandoned. There was optimism prior to the War that Coota was ripe for Rugby League. However the club voted unanimously in 1914 to remain with Union. In 1919 again the five local teams stuck with the old code. However the move was underway. The first recorded match clearly described as Rugby League was a Seniors vs Juniors match on 30 May 1919. The players reported they preferred the League game. When the Bing Boys went to play the Kangaroos in Union-playing Young in July they played Union. The next week the Bing Boys hosted the Temora Juniors – and played under the League rules that Temora were now well familiar with. Overall most games in 1919 were played with 15 men. In 1920, banned from playing at Albert Park on Sundays, League games were played on private property – Quinlan’s paddock. Trips to the nearby and newly League village of Bethungra were also common. On 24 July at last 1,000 people saw the popular Bing Boys defeat Yass at Rugby League on a Saturday at Albert Park. The Bing Boys were the rage of Coota, they tended to play on Sundays, at Quinlan’s paddock, under League rules. By 1921 the change had been quietly put into place – all team lists printed in the Cootamundra Herald in that year included just 13 players. Young, like Cootamundra restarted Rugby Union in 1919. However it struggled to attract public attention. The Young Witness reported in July that ‘unlike Young, football is booming in Harden where the league game is being played’. However in 1920 the Young Rugby League Football Club was formed. There were a number of local teams including Kia-Ora, Spring Creek Warriors, West End and the Kangaroos junior club – while outside town Wambunumba, Monteagle and Marengo were competitive. In July 1920 Kia-Ora lost at Yass in only their second league game but were victorious in the return game. Kangaroos changed codes late in the season. By 1921 League was supreme. Sunday League football it seems still needed to be played out of town at Tipperary until 1921 when the Council granted permission for Sunday football on the Cricket Ground. In nearby Monteagle in August 1920 an embarrassing incident arose. The preacher from Young rolled up to ready the church for the service only to find it full of footballers changing for the match in the paddock next door. The Grenfell Record writer in May 1920 reported that in Sydney 300 teams where playing League and only 40 Union – and commented that it was a pity the ‘boys here don’t play the League code’. However like all towns around, by the 1921 season they were, although it doesn’t seem that a League football club was formerly constituted until 1925 when Frank Burge was engaged to coach. While Orange had moved to League in 1912, Bathurst in 1913 and nearby villages Lyndhurst and Mandurama had formed teams in 1912, it looks as though Cowra’s first game may have been at the end of 1918 at Mandurama. The Cowra Free Press declared the match on Sunday 23 May 1920 between a “Town thirteen” and a Railway scratch team as the first League game in Cowra. During that season there was a mix of rules until all teams changed over. By April 1921 the three Cowra clubs – Federals, Pioneers, and Mulyan Rovers – were committed to League. There was a report from Marengo (Murringo), betweeen Boorowa and Young, in the Burrowa News of 5 May 1911 of a move to adopt League as surrounding districts have. However there is no evidence anything came of it or detail of any surrounding district that had adopted League that early. During the War the Burrowa News carried numerous football reports. This may indicate that people in rural villages felt relatively free from the gaze of authority and propagandists than those in cities and towns – and just carried on. Although they initially stuck with Union, Boorowa, Marengo, Binalong, Bowning and Galong teams were playing League in 1920, with at least one challenge Cup was still being played under the old rules. Like elsewhere in Maher Cup country the change was complete by 1921. Gundagai and Tumut seemed to be the two towns most loyal to the old ways. Gundagai stayed with Rugby Union in 1920 even though in September 1919 Bob Aldridge, Gundagai native and later a Temora Rugby League icon, brought a team to Gundagai to play Union and demonstrate League. The first recorded League match that the author could locate in Gundagai was a visit from the Cootamundra Cadets to South Gundagai on 5 September 1920. In May 1921 the Gundagai football club, the ‘South-western Rugby Union‘, voted 5-3 to play Rugby League, just after Tumut led by Ted Maher had moved to the new code. The Tumut and Adelong areas seemed to have an unusual level of devotion to their Rugby traditions. Perhaps this was the result of a longer period of settlement (70 years) than other towns. 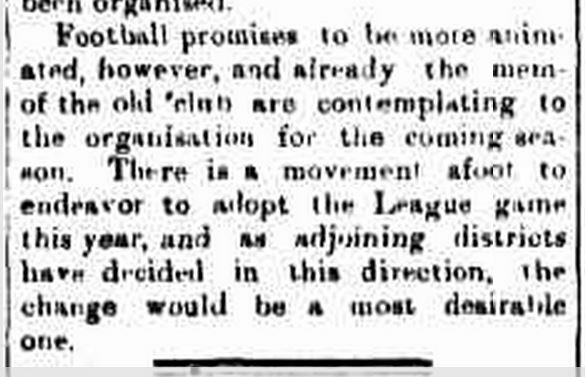 However it wasn’t emphatic – Adelong in 1921 still wanted to stick with Union but were willing to try League if their neighbours preferred it. They did and they did. In April the chairman on the Tumut Ramblers Football Club, E.J. Maher, presided over a meeting where it was determined that the Tumut club would play League. The Maher Cup was now to be a Rugby League Cup. And the timing was perfect, with every town in the region unified in code and hungry to use the rails and emerging motor vehicle to find wider competition. This entry was posted in Places and tagged rugby union, West Wyalong. Bookmark the permalink. I recently purchased a Maher Cup dated 1918 at an antique shop in Mesa, Arizona, USA. The cup was made in England and I ‘m wondering if it is linked somehow to this Austrailian Rugby league?